The Libyan Army was once feared amongst its Arab neighbors with its capabilities shrouded in mystery. 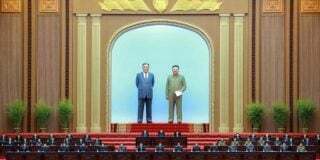 Media streams from the country after the revolution now offer a rare insight into this previously reclusive nation, and shows the DPRK’s influences were larger than once was thought. North Korean-made arms – including some previously unseen in Libya – have surfaced as arms depots have been opened and weapons have proliferated to various groups, including beyond the Libyan government, which originally acquired them. The 1969 coup d’état led by Colonel Muammar Gaddafi resulted in the abolition of King Idris’ Libyan monarchy and the establishment of the Libyan Arab Republic. This quick transition of power brought along a whole new political system and a swift change from a pro-Western foreign policy to a considerably anti-Western foreign policy. Gaddafi embarked on a significant re-armament process in support of his ambitious plan of establishing a United Arab state and, later, establishing an Islamic State in the Sahel. Although most of the purchased weaponry came either from the Soviet Union or France, Libya also turned to the DPRK for the acquisition of weaponry. Ties between the two nations reached a peak during the 1970s and ’80s, when Gaddafi even visited Pyongyang to attend the Arirang Mass Games and formally meet with Kim Il Sung. Later the DPRK would supply a plethora of multiple rocket launchers (MRLs), field-guns and anti-aircraft guns with associated munitions and technical assistance. The Libyan Revolution (2011) and the subsequent Libyan Civil War (2011-present) revealed the extent of North Korean arms deliveries to Libya. 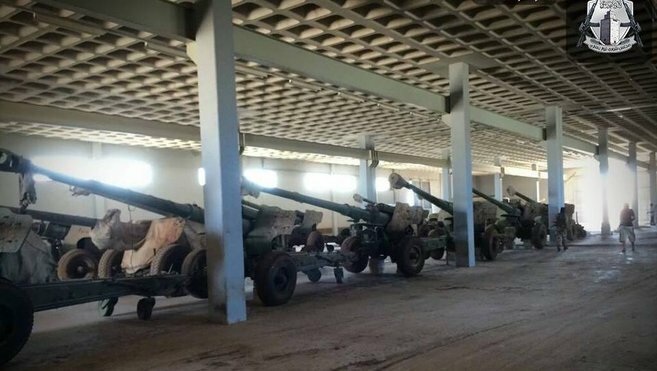 Namely, a series of photos released by the Libyan Ministry of Interior Higher Security Commission’s Facebook page (which has now been deleted) showed the presence of numerous North Korean-designed BM-11 122mm MRLs at a large artillery depot south of Tripoli. Based on the North Korean copy of the unlicensed Japanese Isuzu truck, the BM-11 boasts 30 tubes for the firing of 122mm rockets. 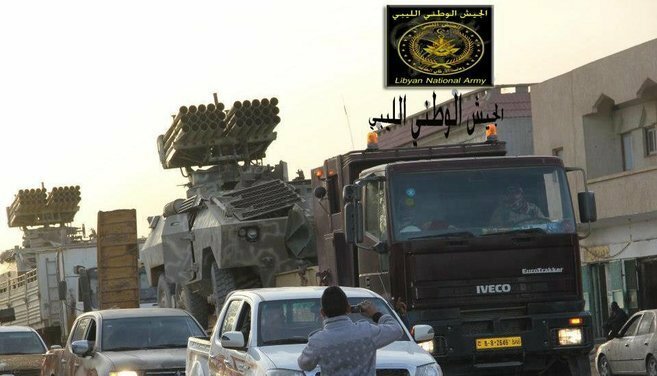 Interestingly, at least one of these trucks was spotted with an American fuel tank installed instead of its more deadly configuration, a modification presumably performed by Libya to support the artillery while moving through the country. Some of the Isuzu trucks that were beyond repair also saw their BM-11 launch systems removed for installment on Brazilian-made EE-11 “Urutu” armored personnel carriers. 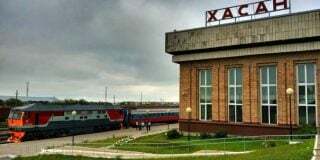 This configuration was not seen being used during the civil war, but the amount of effort put into the conversion means they may yet have an important role to play in the current conflict or those of the future. While the BM-11 has a similar name to a host of Soviet-designed artillery systems and is thus often mistaken for a predecessor of the ubiquitous BM-21 “Grad,” it is actually an indigenous design derived from the BM-21, and was originally produced in the DPRK exclusively. Egypt and Iran have set up production lines of the system as well, however, and produced them under the designation of Sakr/Saqr and HM-20, respectively. 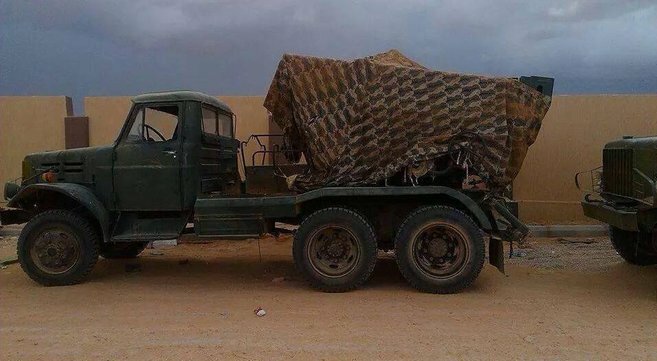 Although none of the BM-11s were believed to have seen action during the Libyan Revolution, some were captured by one of the many factions currently fighting for control over Libya’s cities. 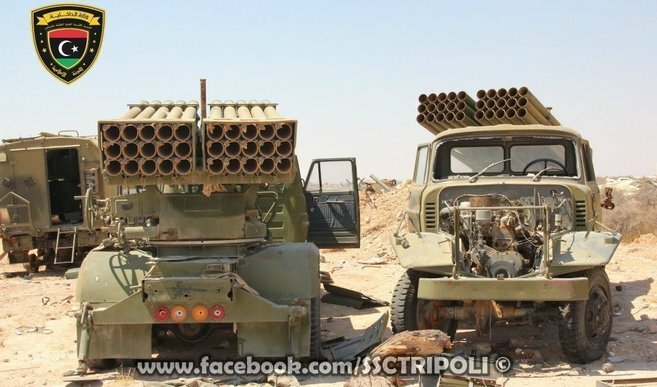 The 122mm ammunition used by the BM-11 is compatible with Libya’s other MRLs: the Soviet BM-21 and the Czechoslovakian-made RM-70, the first of which saw heavy usage in the revolution. Footage of these munitions showed it was smuggled into the country as “parts of bulldozer,” a label that has been seen used on other North Korean arms shipments in the past as well. 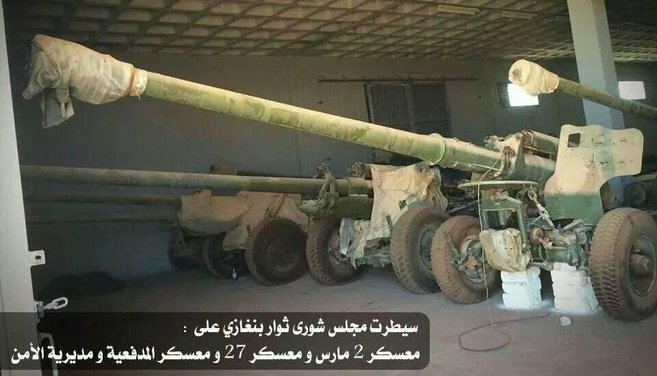 Other footage of a 14.5mm ZPU-4 anti-aircraft gun in use with Libyan rebels revealed a Korean plate and serial, identifying the weapon as “64,” the North Korean name for the indigenously produced ZPU-4. These systems continue to see use, as they are very effective against slow-flying aerial targets and, more importantly, make for a solid fire support system against infantry. 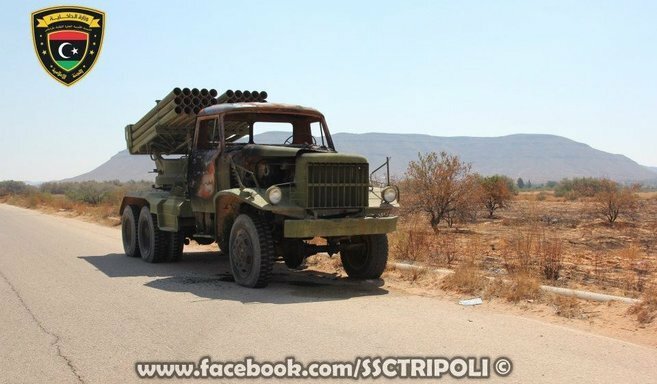 Interestingly, the capture of several arms depots in Benghazi by Thuwwar Majlis Shura, one of the factions fighting in the Libyan Civil War with links to Ansar al-Sharia, did not only see multiple rocket launchers and even surface-to-air missiles (SAM) fall in the hands of Thuwwar Majlis Shura, but also numerous towed artillery pieces, a large number of them made in the DPRK. Although hard to spot between the regular Soviet-made 122mm D-30 howitzers and 130mm M-46 field guns, one of the depots also contained a dozen or more 122mm field guns designed and produced by North Korea. These 122mm field guns are of an indigenous design derived from a mixture of older, Soviet towed artillery pieces, and were known only to be used in the DPRK up until now. 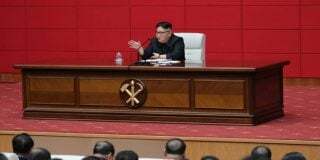 As seen in the above photograph (in the front row), the North Korean-made 122mm field guns can be distinguished by the muzzle brake reminiscent of the 122mm D-25 seen on the IS tank series and the gun shield, which could for instance have been inspired by the 152mm D-20’s. As the new imagery proves this system to be one of the many recently discovered to have been exported by North Korea, Libya can now be added as a user. Also believed to have been acquired are 107mm Type-63 towed multiple rocket launchers, although these are also produced in a range of other countries and can thus not be confirmed to have originated from North Korea. Alongside various types of small arms that have not yet been spotted, these are likely candidates to have once been delivered and are now slowly forgotten over time, only to be dug up again for the recurring waves of conflict that trouble the nation. All this weaponry was believed to have been originally destined for the Islamic Legion and the People’s Militia. The Islamic Legion was the main force used as a part of Gaddafi’s ideas for “liberating” Arab and African states while the People’s Militia was tasked with maintaining internal control in Libya, and would have been attached to regular army units when the need arose. Another much-publicized aspect of North Korean and Libyan cooperation came in the form of the delivery of a range of ballistic missiles, supposedly of the Hwasong-5 and 6 variants. The imposed arms embargo on Libya prevented the acquisition of large amounts of modern weaponry and spare parts for Libya’s ageing arms inventory. The delivery of numerous, more capable ballistic missiles would have enabled Gaddafi to revitalize his deterrence against nations interested in removing him from power. However, the delivery of large amounts of ballistic missiles stayed out as most shipments were intercepted while still at sea. 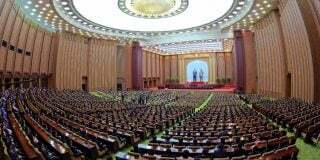 In fact, one such interception supposedly included that of a shipment transporting an entire assembly line for the production of North Korean Hwasong missiles, which put a serious snag in Libya’s plans of expanding their missile forces. While Middle Eastern militaries continue to tear themselves apart in the whirlwind of violent wars left in the wake of the once so hopeful Arab Spring, a fog is lifted and more and more evidence of North Korea’s hand in the geopolitical game becomes available. Where and what equipment will pop up in the inventory of one of the regime’s many (former) allies might be unknown, but the fact that it will is undeniable. Subscribe to read the remaining 1360 words of this article.